On August 28th 1963, Martin Luther King, Jr. delivered his famous ‘I Have a Dream’ speech at the Lincoln Memorial, Washington, DC. The speech was a call for racial equality across the United States. Civil rights were (and continue to be) a major issue in America, not only for black Americans but several other ethnic groups. Slavery had only been outlawed a hundred years earlier (1863) and for many there remained maltreatment, inequality and even brutality within society. The southern states had a particularly poor reputation in how black people were treated, with beatings and lynchings still occurring. In the search for change there was divided opinion as to whether peaceful protest or civil disobedience was the best direction to achieve results. 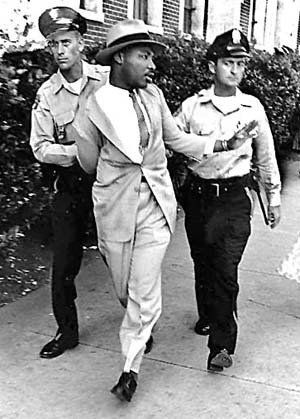 Dr. Martin Luther King, Jr. was an advocate of peaceful but strong protest. A baptist preacher in a church in Montgomery, Alabama, he had been a key figure in the Montgomery bus boycott. Instigated by two cases of black women being arrested for refusing to give up their seats on public buses (the first was Claudette Colvin, the second Rosa Parks). The boycott lasted over a year, made King and Parks household names, and is seen as a major moment in civil rights activism. In 1957 King was elected the leader of the Southern Christian Leadership Conference (SCLC), a group of black church leaders promoting nonviolent civil rights protest. They targeted Jim Crow laws, the laws in southern states that enforced segregation of races. King lead and participated in numerous events across a variety of states in the following years. In August 1963, the SCLC was one of the main groups involved in organising an event formally called ‘March on Washington for Jobs and Freedom’. The idea was for a mass protest to march through America’s capital on the 100th anniversary of Lincoln’s emancipation proclamation, although initially it did not have unanimous support due to some of the participants. The event did, however, have the attention of President John F. Kennedy. Kennedy was a supporter of King’s cause but had originally been against the march, believing it would make people reject civil rights legislation. However, when he saw the march was going ahead, he supported it, inviting local Washington church leaders and the head of the union for automobile workers to help organise large numbers. King’s main speech was written before the event and was styled to echo Lincoln’s famous Gettysburg Address. He also alluded to many of America’s most famous documents, including the Emancipation Proclamation, the Declaration of Independence, and the US Constitution. However, it was a section at the end, believed to be ad-libbed, that was to become the most famous segment. 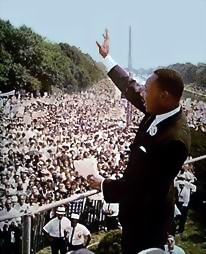 A shout from the crowd, from gospel singer Mahalia Jackson, said ‘tell them about the dream, Martin’. After a pause, he began the next section with the words ‘I have a dream’, a line he then repeated and emphasised before each subsequent portion. The entire speech lasted for 17 minutes. The speech was a success and helped push the Kennedy administration towards making political change. It also made King one of the star speakers in America. He was named Time Magazine’s ‘Man of the Year’ in both 1963 and 1964, and became the youngest ever recipient of the Nobel Peace Prize when he received it in 1964. 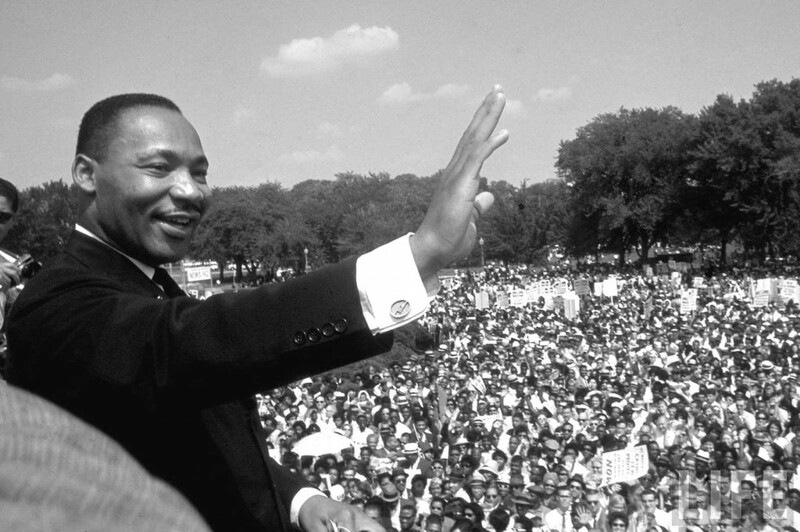 ‘I Have a Dream’ has since been named the greatest American speech of the 20th century. 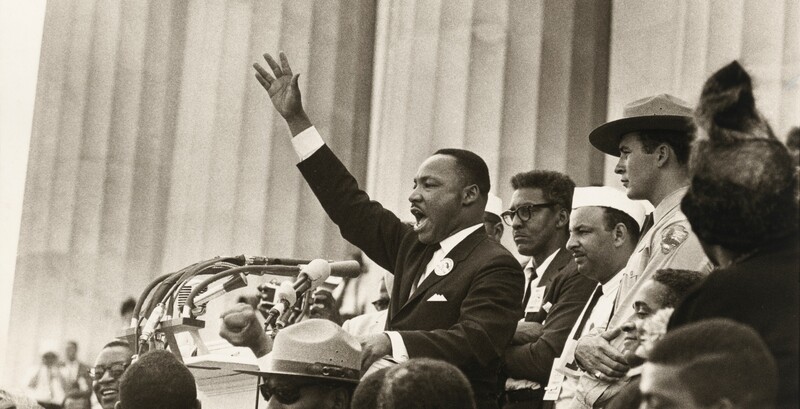 King continued to be involved in civil rights campaigns and marches until he was assassinated in 1968 in Tennessee.